Local Chinese restaurant will make your wallet and appetite happy. Good Chinese food can often be hard to find on a student budget. Most of the time you have to settle for Panda Express, eat cuisine from a different culture, or just give up on life. 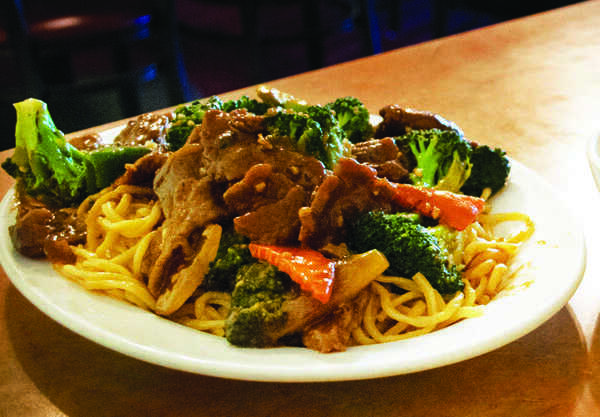 Wong’s Canton Chinese Restaurant offers another option. They serve delicious Chinese food at low prices, and are located less than three miles from American River College. The small building is easy to miss if you aren’t looking for it. Inside is a compact dining area with about a dozen tables and booths with light pink wallpaper and paintings depicting traditional Chinese culture hanging on the walls. The first thing I noticed was the takeout menus on display. Takeout is important if you are in a rush, and, while I was there, several customers came in to pick up orders. A quick look at the menu shows typical favorites like sweet and sour chicken or pork, broccoli beef, lemon chicken, pot stickers, orange chicken, and a variety of rice and chow mien. Entrées come with wonton soup, which is brought to you immediately. I was pleasantly surprised to find potatoes in the soup, ultimately enhancing the flavors and making it delicious. It was the perfect balance of flavors, and was comparable to soups at more expensive Chinese restaurants. From the time the order was placed, no more than 10 minutes passed before the food was brought out. I had broccoli beef with chow mien and orange chicken with fried rice. The noodles had an excellent texture and weren’t under or over cooked. The broccoli was well steamed and not too soggy, and while the beef wasn’t anything special, it was pretty tasty. The orange chicken came in a delicious sauce that was garnished with real oranges, and while the rice was a little dry, the entrée was enjoyable. The most surprising thing about this meal was the price. For less than $13, two entrées turned out to be more food than we could handle. The waitress kindly offered to box up our food, and didn’t just bring out boxes, she boxed it up for us. Wong’s is known for large portions at low prices. Be the first to comment on "You can’t go wrong with Wong’s Canton"